Urvi Parikh does not recommend Namaste England at all. Namaste England is all things that the Akshay Kumar-Katrina Kaif starrer Namastey London was not. Though it isn't a sequel, the basic premise of the movie is the same. Namaste England turns out to be a melodramatic affair that fails in creating an impact. 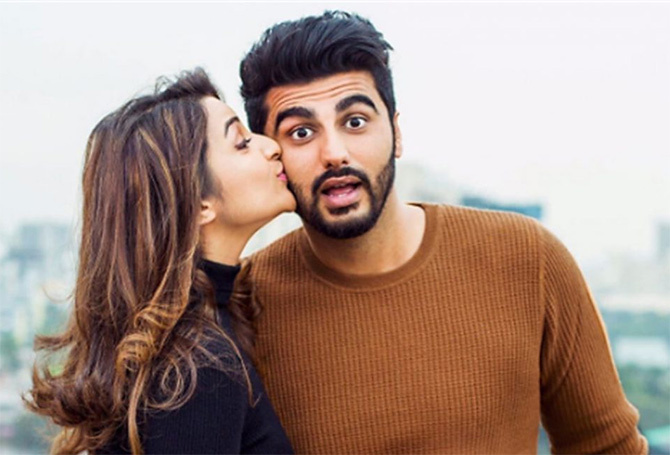 Arjun Kapoor's Param is madly in love with Parineeti Chopra's Jasmeet. While Arjun wants to marry the love of his life, Jasmeet, despite her love for the guy, has other plans. Fed up with her family's patriarchal mindset, Jasmeet's priority is to move to London, and she finds support in Param. Matters take an ugly turn and Jasmeet flies to London, breaking Param's heart. To win her back, Param travels to London and what happens next is the story of the film. Director Vipul Shah fails to give us a crisp storyline, hard-hitting dialogues and memorable punch lines. While watching the movie, you surely miss those Punjabi romantic lines that Akshay mouthed to Katrina and their iconic patriotism scene in the earlier Namsate film. The movie, in some way, tries to deal with the sensitive issue of women empowerment. But the depiction is so wrong that at the end of it, you only feel sorry for the crew. Arjun Kapoor, as Param, is the husband every girl dreams of. He is perfect and somewhere reminds you of his husband-like qualities in Ki & Ka. But his character is sketchy and the bad writing limits him. At the end of the film, you feel sorry for Arjun. His earnest attempt doesn't work. Parineeti is this vivacious Punjabi girl who wants to challenge patriarchy. But except for her beautiful Punjabi dresses, there's nothing praiseworthy about Jasmeet. At one point you feel Jasmeet is this selfish woman who uses Param for her benefit, and you sub-consciously root for them to not end up together. A special appearance by Mallika Dua is the only good thing about the film. She makes you laugh for a bit in this otherwise boring movie. Aditya Seal, in a special role, does a fairly good job. But given the goof ups in the writing, we don't blame him for his performance. Namaste England drags after a point. You neither sympathise with the actors nor empathise with them. I won't recommend you to go through this one. Instead, watch Namastey London once again!